Not since the early part of this decade have so many U.S. consumers fallen behind on their credit cards and on auto loans arranged through car dealers, according to new bank industry data. In the fourth quarter of last year, 3.22% of bank-issued credit card loans were at least 30 days late, which was higher than at any point since 2011, the data from the American Bankers Association showed. The late-payment rate for indirect auto loans — which are bank loans that are made as part of the process of purchasing a vehicle — climbed to 2.08%. That was its highest level since 2012. 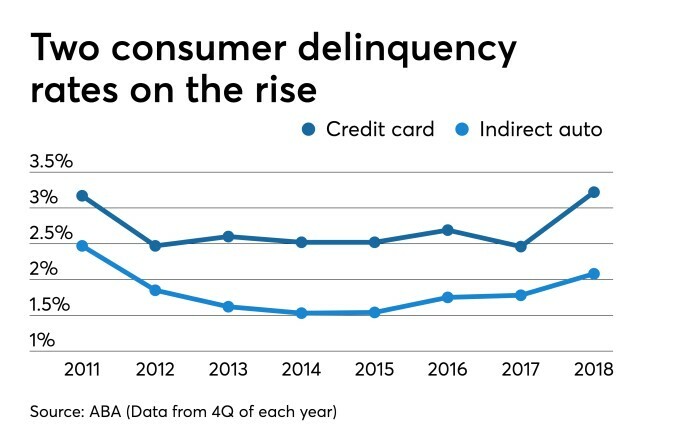 “The delinquency trends we’re seeing are typical of what happens at this stage in the business cycle, particularly as it relates to auto and credit card delinquencies,” James Chessen, chief economist at the banking trade group, said in a press release Thursday. Late-payment rates in the credit card industry have been on the rise following a period of historically strong credit quality after the Great Recession, when many bad loans were charged off. In the auto lending realm, underwriting standards have loosened in response to the sector’s relatively strong performance during the last downturn. Worries about the laxity have mostly focused on subprime auto loans, a segment where big banks have had a larger presence than small banks and credit unions. Banks are faring better in other parts of the consumer finance industry than they are in credit cards and indirect auto loans. The percentage of personal loans that were at least 30 days late fell to 1.26%, its lowest level in at least seven years, according to ABA data. The improvement could be due in part to a shift in who is using personal loans. Last year, 66% of personal loans went to borrowers with credit scores above 660, up from 59% in 2013, TransUnion said this week. The ABA uses a quarterly survey of banks to track trends in consumer credit performance. “Consumers’ financial health overall remains solid, supported by a strong job market and continued wage growth,” Chessen said in the release.